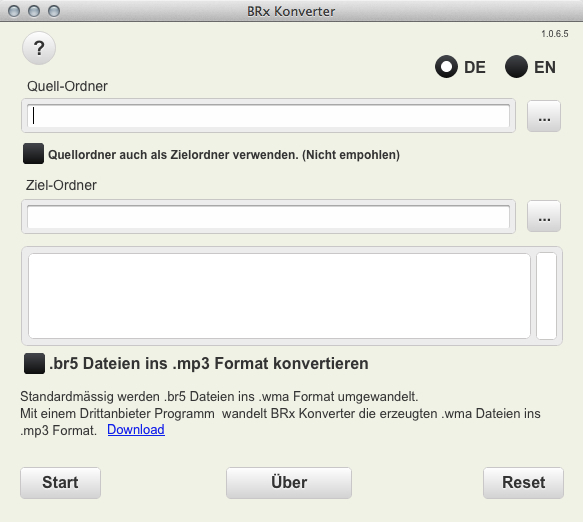 BRx Converter for Mac allows users to convert br3, br4, br5, br25, br27, br28, br29, br31, BR32 and br48 audio files (created with a BMW car navigation system) back into mp3, mp4 and wma and several other audio files. The user just have to select a source and a target folder. The program searches the source folder and its subfolders for the audio files and write them back to the target folder. If you need more information please contact the developers of BRx Konverter for Mac (Matthias Rebbe), or check out their product website.